The elder law attorneys at The Elder Law Firm PC want you to be informed. Our experienced attorneys specialize in the law relating to Medicaid and long-term health care issues. We find honest ways to protect our clients’ homes, loved ones, values and independence — to ensure that our clients never run out of money and never run out of options. We can protect your family when you are at risk of going broke and/or losing your home because either someone is already admitted to, or is about be placed in, a nursing home. 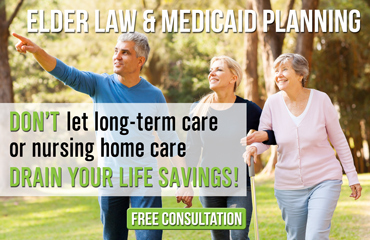 Learn more about our Michigan Medicaid planning here. The estate planning attorneys at The Elder Law Firm PC work to ensure that your assets are protected from all conceivable threats — not just long-term care expenses. Our elder law attorneys provide you with comprehensive estate planning options for assuring the long-term financial security of you and your loved ones. Learn more about estate planning here. As elder law attorneys, we can help you understand your options as you struggle to provide dignified long-term care for a wartime veteran and/or their spouse. Learn more about how we can help you gain veterans benefits here. You may collect Social Security Disability Insurance Benefits (DIB) for yourself and your surviving spouse and children if you are an insured worker. Individuals with little or no income and resources are eligible to collect Supplemental Security Income (SSI). Learn more about social security disability benefits here. Michigan Elder Law Attorneys at The Elder Law Firm PC provide assistance in protecting your assets and protecting your family. Contact us by calling 616.840.3754 or by requesting a free consultation online here.